Review by AllTheBestFights.com: 2018-04-07, one sided fight between Nordine Oubaali and Luis Melendez: it gets two stars. The undefeated Olympian Nordine Oubaali entered this fight with a perfect boxing record of 13-0-0 (10 KOs=77%) and he is ranked as the No.10 bantamweight in the world (currently the #1 in this division is Jamie McDonnell). He fought twice last year defeating Alejandro Hernandez (Oubaali vs Hernandez) and Mark Anthony Geraldo (Nordine Oubaali vs Mark Anthony Geraldo). His opponent, Luis Melendez, has an official record of 47-11-1 (34 knockouts) and he entered as the No.67 super bantamweight but he comes off the loss against Lodumo Lamati in 2017; before this bout, in 2016, he had beat Hugo Berrio and Jose Sanmartin. 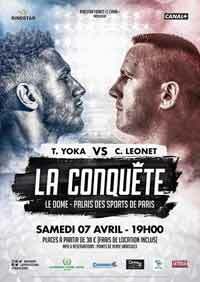 Oubaali vs Melendez is on the undercard of Tony Yoka vs Cyril Leonet. Watch the video and rate this fight!